[Episcopal News Service – Austin, Texas] “Welcome home,” said House of Deputies President the Rev. Gay Clark Jennings following a July 11 unanimous vote by deputies to concur with the House of Bishops and admit the Episcopal Church of Cuba as a diocese. Following testimony that was cut short because no one had signed up to testify against admitting the diocese, Jennings called for a moment of silence before the historic vote. The Diocese of Cuba is set to join Province II, which includes dioceses from New York and New Jersey in the United States, Haiti and the Virgin Islands. Immediately following the House of Bishops’ July 10 vote, Cuba Bishop Griselda Delgado del Carpio was seated in the House of Bishops. Immediately following the July 11 vote, the Rev. Gerardo Lojildes, who in addition to his ministry oversees construction at Camp Blankingship, an Episcopal camp in Cuba, and Mayelin Aqueda, president of Episcopal Church Women in Cuba, were seated as deputies between the dioceses of Venezuela and Puerto Rico. Following the vote and a prolonged standing ovation, Jennings invited Delgado to address the house. “Right now, I feel that the Holy Spirit is blowing on this entire convention and that it is moving: It’s moving here for all of us to really work with it in this very difficult world to make sure that we fulfill the needs of this world,” said Delgado through a Spanish-language interpreter. 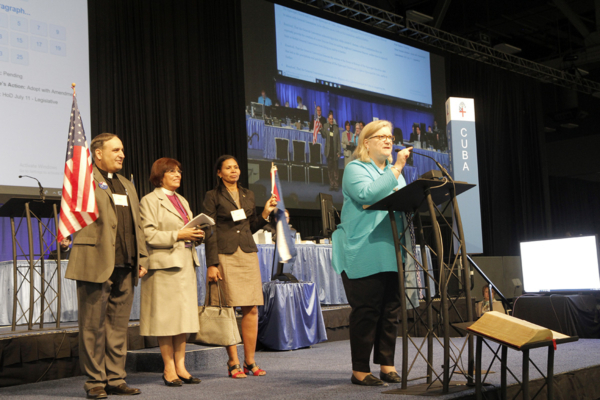 More coverage of the 79th General Convention’s actions to admit the Episcopal Church of Cuba as a diocese joining Province II is here. – Lynette Wilson is a reporter and managing editor Episcopal News Service.